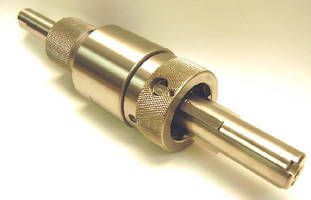 Expanding Mandrel provides 0.0002 in. TIR accuracy. Featuring sliding-jaw design with mechanical rotary mechanism for clamping workpiece, LeCountÂ® Type G Expanding Twist Mandrel provides optimal torsional and axial holding power, and wide expansion range to accommodate bore sizes from 1-3 in. Mandrel is suited for O.D. and face grinding operations where parts have smooth bore, as well as non-gear grinding process applications such as cylindrical grinding. Rochester, New York, May 13, 2009 - Gleason Corporation, the worldwide leader in gear technology, is proud to announce an expansion in the LeCount® expanding mandrel line with the new Type "G" Expanding Mandrel. Gleason's new LeCount Type G Expanding Mandrel is based on our highly successful line of inspection mandrels. The new Type G Twist Mandrel is bringing LeCount performance to a wider range of applications, particularly O.D. and face grinding operations where parts have a smooth bore and non-gear grinding process applications such as cylindrical grinding. The new LeCount Type G Twist Mandel features a unique sliding-jaw design with a mechanical rotary mechanism for clamping the workpiece. It provides 0.0050mm (0.0002 in) TIR accuracy, tremendous holding power torsionally and axially, and wide expansion range to accommodate bore sizes from 25.40mm (1in) to 76.20mm (3in). Gleason Corporation is a world leader in the development, manufacture and sale of gear production machinery and related equipment. The Company's products are used by customers in automotive, truck, aircraft, agriculture, construction, power tool and marine industries and by a diverse set of customers serving various industrial equipment markets. Gleason has manufacturing operations in Rochester, New York; Rockford, Illinois; Dayton, Ohio; Plymouth, England; Munich and Ludwigsburg, Germany; Bangalore; India; Studen, Switzerland; and Suzhou, China and has sales and service offices throughout North and South America, Europe and in the Asia-Pacific region. More information about Gleason Corporation is available on the World Wide Web at www.gleason.com. Saw Arbors suit CNC Swiss machining applications.